I’ve said it before and will say it again – timing and mood matter with beer. You can have a great beer when you’re not in the mood for it, and most of its charms will be lost on you. This happened to me a few times by the tail end of GABF, when I was totally beered-out. You can also have an average beer that hits you at just the right moment and it can carve out a special place in your heart. For me, this happened with Leinenkugel’s Summer Shandy, a beer that many people loathe and I love because of the circumstances under which I took that fateful first sip. But then there’s those rare times when you have a great beer that perfectly fits your thirst. This is where the magic happens, when you taste every bit of the brewer’s art and you are transported to a happier place. This is exactly what happened with me and Schlafly’s 2008 Reserve Imperial Stout. Now, the 2008 Reserve had a few things working in its favor. It’s an Imperial Stout, which is probably my favorite style of beer. It was also aged in bourbon barrels, which is another one of my favorite things. It’s also a bit boozy, with an ABV of 10.5%. And it was at the end of a long and fairly crappy day, and I was in a foul mood and I needed a good beer. And it’s a very, very good beer. 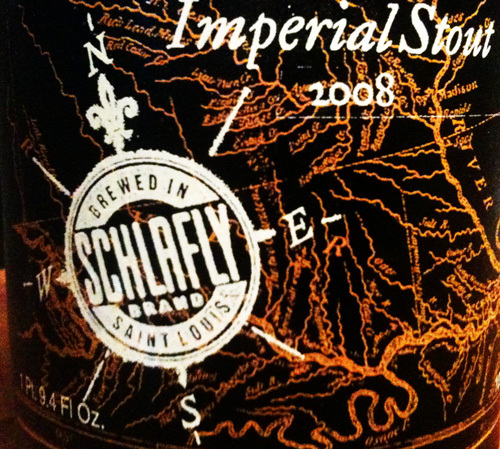 One thing I really appreciate about this beer is that Schlafly’s didn’t ask me to age it – they did it themselves. It’s a 2008 vintage that’s on shelves now. I wish more breweries would do this, as I have no discipline when it comes to beer, and anything I buy I’ll drink sooner rather than later. If a beer is meant to be aged, then age it at the brewery please, and don’t release it until it’s ready. 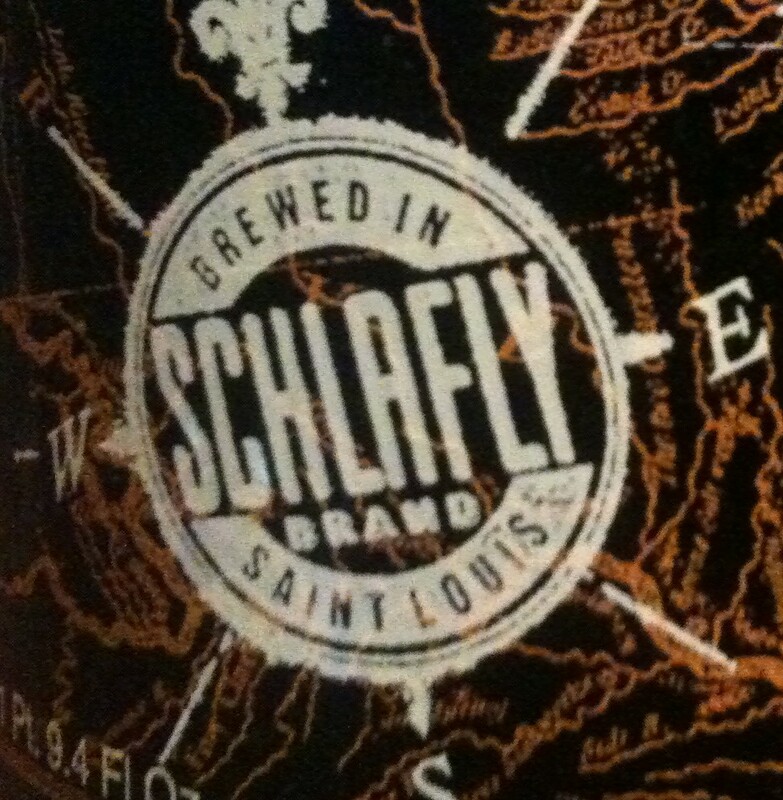 Schlafly’s get this right, and I’m grateful for it. The pour is as black as you’d expect, with a small tan head that disappeared and left some lovely lacing draped about the insides of the glass. The nose was lots of dark fruits, oak, sweet cocoa all piled on top of the seductive scent of bourbon. The first sip powered smoothly across my palate, with the flavor of dried dark fruits and whiskey barrel notes working in perfect harmony to deliver one of the most pleasurable beer drinking experiences I’ve had in a long, long time. In the background, chocolate and caramel conspired to keep the booze and the roastiness of the malts from getting out of hand. A mellow, boozy finish followed, and as it slowly faded, a broad smile formed across my face. This beer absolutely transported me, and after just a few sips, I was relaxed, happy and the best version of myself I could be at that moment. 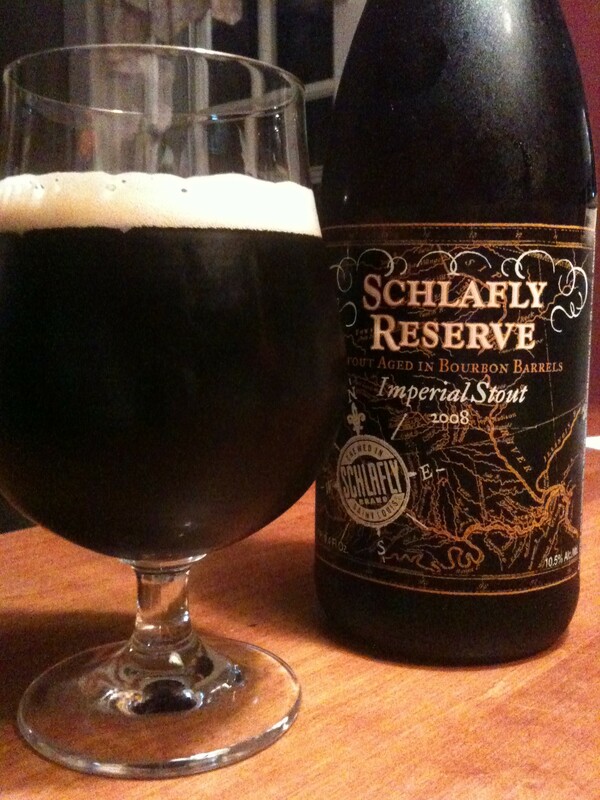 It’s been a while since the flavor of a beer has had such an effect, but the Schlafly’s 2008 Reserve definitely worked its magic on me. I love it when an excellent beer hits my palate just right and I find a new favorite brew. I find that when this happens, a little bit of that magic happens every time you have the beer in the future, as your mind snaps back to that perfect moment. I’ll have the chance to find out, because I went back to the beer store and picked up three more bottles of the 2008 Reserve. I’m not sure how many times I passed over this beer on the shelf before finally picking one up. It’s in a box (not pictured) and for some reason I always look past the boxes. The ladies at checkout thought it was whisky at first, so I guess I’m not the only person who finds beer in a box a little odd. Anyway, keep your eyes peeled for boxes if you seek this one out. The plan is to drink one (which I already did), save one, and send one to my brother in Idaho. But to be honest, I don’t think they’ll last the week, and I don’t think Don will be getting a taste. Like I said, if it’s in the house, I’ll drink it sooner rather than later. And with a pre-aged beer of this caliber, why wait? I feel lucky that I got to try this beer. It was a gift from the owner of a beer store that I frequent when he showed up at my toy collection party last year. I saved it for a special occasion (because it looked like a beer that deserved one) and shared it with some friends for the finale of Lost. It did not disappoint, it’s one of the best beers I’ve ever had. Sadly it’s not distributed in Minnesota but happily we made a trip down to KC in July and I bought a store out of every bottle that they had. I thought it was a steal at $10.49 also so buying ten bottles didn’t hurt the pocketbook too badly. I also bought some of their American Pale Ale and Kölsch (both awesome beers) and a couple bottles of their Schlafly Reserve Barleywine Style Ale Aged On Oak and a few of their Quadruples. I haven’t tried the last two yet but if every other beer I tried from them is any indication, they’ll be equally terrific. I bought every bottle they had on the shelf but one, leaving it for the next guy. I hope I don’t regret that later. Everything I’ve had from Schlafly’s so far has been pretty darn good, but we don’t get a lot of their stuff out here, so I’m not sure there’s enough data to go on. I can say that this is one terrific beer. No olive undertones like the 2006 we had in Boise? Even with the olive, that I didn’t really notice until you pointed out, I thought this beer was fabulous. Please send one to Don and tell him to share it with me! Not a hint of olive, but I swear I can almost taste how it might emerge if this beer were aged for a couple of years. I’m a little nuts with the olive thing, I think. I had no real plans to ship one of these to Don, but now you make me realize that I have you, Rick, Chris and the rest of the crew from Brewforia to consider. I’ll package one up and get it out there soon. And I’l let you know so Don can’t keep it all for himself!! Oh, I was at @Brewforia this weekend and noticed that they had Hale’s Supergoose DIPA. Not sure if I’m recalling correctly, but last year it went fast and I thought you wanted to get your hands on some. I didn’t check Rick’s price, but last year I thought it was a good value. I think it was $4.99 for a bomber at the Co-op. Also, this weekend Rick had Widmer Brother’s Reserve Brrrbon on tap. It’s last year Brrr seasonal aged in Bourbon barrels for a year. I had some. Enjoyed it quite a bit. It’s not a big bourbon, more balanced I’d say. And Rick noted that it was better on tap than in the bottle (he’s got those, too). Thanks Chad. IF…Jim sends one, I will be sharing. I’ll try and let you know when I will be @Brewforia with it, that is if Jim actually sends one. Don’t think he wasn’t being truthful in his post, he really doesn’t have any self control and he will drink every ounce of that stuff if the mood strikes. Like your description, i could almost taste it. Thanks, Dave. I hope you can get your hands on some – it terrific stuff.